Blacks, Gwendolyn Brooks, Third World Press, 1994 (c1987), ISBN 0-88378-105-0, $19.95, 512pp. 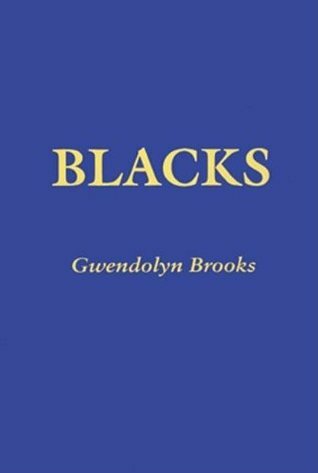 A collection of poetry by Brooks, probably the most honored African- American poet. It also includes “Maud Martha,” Brooks’ single novel to date. I liked the novel, but felt it was a little too much for me. I like poetry, but I think I like it in small doses, where I can relax and read and reread it without concentrating on how much time it is taking me to do so. Her fiction is like poetry, in the sense that it had as much to do with the vision of things as it did with the characterization or the plot. This is my failing as a reader: I’ve never cared that much for description, and the longer it continues, the more likely I am to tune out. But the short poems here, especially from her earlier period, I like a lot. The subjects are strong and powerful, the economy and purpose of the prose admirable. One of my favorites was a poem called “Queen of the Blues,” which contrasted the stage persona of a Billie Holiday-like singer with the treatment she receives as an African-American woman. Queen or no queen, she still has the blues. Or “The Murder,” about a young boy who sits his toddler brother on fire then doesn’t understand when the little brother isn’t around afterwards. I did not care as much for her later poems, which were much more experimental in form and harder to follow in content. A correspondent also complained about the later poems, bothered by their lack of rhyme and lack of clear purpose. While it is true that the latter selections don’t rhyme, it’s not true that not all of it doesn’t. A LiveJournal user posted their essay on “Queen of the Blues,” along with the entire poem. I think it shows that Brooks has something to say and does so fairly clearly, although any poetry worth anything contains subtext and imagery that deepens with increased familiarity. Previous: Blackadder, Richard Curtis et al.